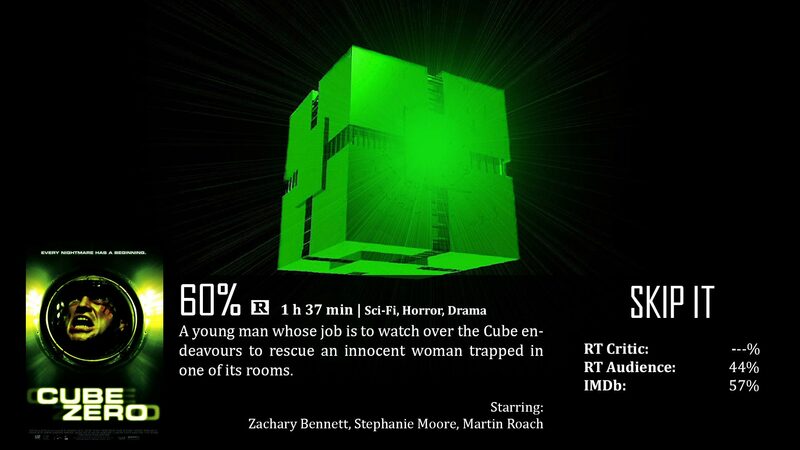 And now we move on to the third film in the Cube franchise, which is Cube Zero. When I first saw this film, I initially thought it to be a prequel to Cube, because the ending seemed to clarify a connection to the first. I won’t spoil anyone, but I realize now that I was wrong. It could still be a prequel though, because of the way the cube itself looks (more primitive than any of the other films). The thing is, did it up its game in any way? Kind of, but for the most part…not really. Cube Zero is pretty much Cube with an extension on the perspective. The cube itself is almost the same exact thing as in the first film, except the look itself seems to be a bit older. There are still death traps and participants, but this film offers a little bit of an explanation, as it shows two employees outside of the cube and pushing buttons to control the environment inside. Right away you know they don’t know everything and are almost considered prisoners themselves, but what you do know is that the cube is apparently a prison for people that wanted an alternative choice to the death penalty…but that may be fabricated so the employees don’t question the morality behind the thing. What happens though, when one of the workers decides to go into the cube with the knowledge of how to get the prisoners out? There are things I like about this film as well as things that I really didn’t. Like the others, there were enough different elements throughout that were easy to distinguish between the films. Here’s what I liked in a nutshell – the outside perspective, the search and rescue, the acting, characters, and end. Here’s what I didn’t in a nutshell: it’s getting old. You can change the perspective, traps, and cube itself all you want, but what it comes down to in the end is that it’s still a blasted cube. There are still participants, death traps, and a complicated way to get out of this maze. Three times just may be one too many. 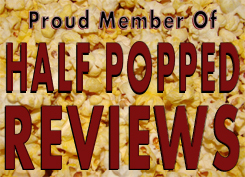 However, the acting actually improved with each film, and it was halfway decent in this film, oddly enough. The characters were still evenly spaced with diversity and with their own personal histories, and you like all of them. Yes, they kind of overdid it in this film, as two of the characters wind up being really, really cartoonish, but the rest of them are good, even enlightening by the end. The thing is, I don’t think I’ve ever been so torn about a film in this series. I liked it, but at the same time I didn’t because I believe it wasted some really good potential. It came full circle in a way, but not a really smart and cool way which was incredibly doable. I’m talking about a twist ending that wouldn’t feel cliché. I’m trying to work my way around the spoiler as much as I possibly can, but you’ll understand when you actually see the film. I just think that in the end it just comes down to level of entertainment. How does this film make you feel? The truth is…not overjoyed, not surprised, but maybe a bit tired…of seeing the same thing over and over again. You might like the outside perspective, but at the same time, the mystery of Cube doesn’t work unless the whole thing takes place in that room that’s 14 cubic feet. So there’s that. I don’t know…there’s just a lot of different things this film could have ultimately done better. I’m actually impressed that Cube Zero was still able to provide fresh ideas, and a new perspective is welcome. The direction this film goes is an interesting one to say the least. Unfortunately, there’s just not enough good to say about this film. It’s the same thing a third time, the changed perspective, while welcome, takes away from what made Cube special in the first place. I mean, they had to do it or else it would be the same thing, but they didn’t need to make this film in the first place. The ending could have been seriously epic, but they decided on a safer route, which just ends up being more confusing than it needs to be. There’s a couple of cartoonish characters that water down the seriousness of the film as well. Eric Wynn: This room is… green. I wanna go back to the blue room.